As I walked into Tahrir early this morning my head was held low with shame, I could not been there earlier. Many of the fellow revolutionaries have fallen and I was not there beside them. 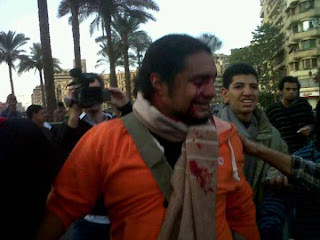 Prominent Egyptian Blogger Malek smiling nonchalantly after having been shot in his right eye on Nov 19. I met a man with an ashen face, he has seen too many youth fall and has endured incredible quantities of CR gas. He was in the square for a small respite, and was heading back to the front lines in Mohamed Mahmoud St. shortly. Ahmed has been enduring fierce battles for 36 hours and has a steely determination that he will not leave Tahrir before the supreme council of the armed forces (SCAF) steps down. He was tired, happy and hopeful. I asked him: what comes after SCAF? He said it could be a presidential council. When I pressed him for the mechanism, Ahmed was not sure. However, it was pretty clear for him that he could tolerate any more lies. SCAF has deceived, lied, and connived to liquidate the forces of the Egyptian revolution. It has accused members of Egypt’s April 6th movement of being foreign agents. It has allowed members of Mubarak’s NDP to regroup to play a prominent role in the elections. It has fomented sectarian strife and done little to protect Egypt’s Copts. It has done a lousy job of managing the economy and bringing the country closer to stability. Finally, in what should have Egypt’s first experience of honest elections, it has presented Egyptians most algorithmically complex elections system ever. But the final straw was when the riot police violently broke up a sit-in that was stated by the revolution’s injured. SCAF has reneged on its promise that to rehabilitate them and take care of their medical expenses. Ahmed is not fighting for a clear idea of what he wants in terms of a political way forward, but it is clear to him what he is against. He can not tolerate more lies. He is fighting against a world where those who claim their freedom are murdered and dumped with trash, and where the injured are treated as human refuse. He will do his best to change that world for the better, or die trying.